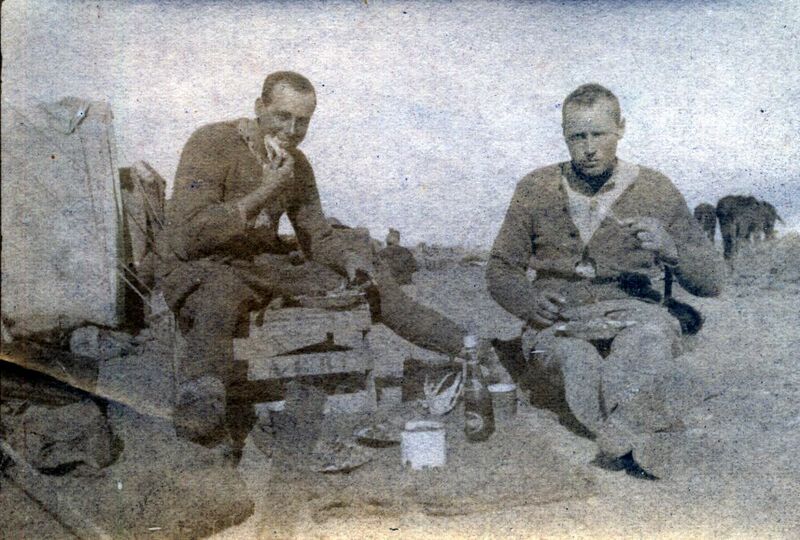 Wynton French (left) and a friend enjoy Christmas dinner at Rafa, December 25, 1918. Wynton French was born in 1893 at Newman near Eketahuna, the son of William and Isobel French who farmed there. His family moved to ‘Beauley’ in the Mangapakeha Valley near Tinui in 1911 and he worked as a farmer. He was a Territorial soldier with the 9th (Wellington East Coast) Mounted Rifles. He joined up in 1917, entering camp on 5 March and becoming part of the 28th Reinforcement to the Mounted Rifles Brigade, service number 48012. His group sailed to Australia before continuing on the Australian troopship Port Lincoln to the Middle East. After training at Moascar Camp, Egypt, Wynton was posted to the Wellington Mounted Rifles in September 1917. He took part in the later part of the Palestine Campaign, when the New Zealand Mounted Rifles Brigade was operating in the Jordan Valley. He recorded his war service in many photographs. After the Ottoman Empire surrendered in October 1918, the Wellington Mounted Rifles spent some months in Palestine before returning to Egypt in March 1919 to help control riots there. Wynton embarked for New Zealand on 30 June 1919 and his discharge certificate was dated 20 August 1919. He resumed farming and in 1920 married Eileen Cripps. The couple had five children and they continued farming at ‘Beauley’ until retirement, when they moved to Masterton. Wynton French died in 1968 and is buried in Masterton Cemetery.